20160921 + Up in the am and in to work. Glued to the desk today knocking things out like crazy. Left a couple minutes early to pick up auction items. Home and L&G at G's practice. 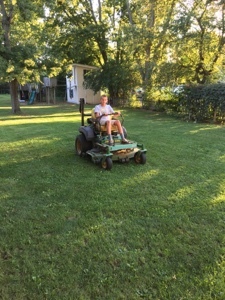 J home from xc practice, made himself dinner, did his homework then mowed the front yard. I got Doc's big mower and mowed the back. D got home, ate and started his homework. L&G home, all cleaned up and to bed. I was up late with D helping him with his homework.